Paltalk 11.7 came out with not that many new features that I have noticed. I try it out to see if all the programs work for this version and so far after testing all the paltalk programs all seem to work fine for this new Paltalk version. If you find that some of the programs are having problems and are not working, let me know. It open rooms list at startup. Paltalk Winamp Bot and Paltalk Sharer do NOT work with 615. I’m having issues with the trivia bot, which downloads ok but wont connect to the paltalk room i’m in and wont start. It asks for the .NET which i cannot download for some reason, i’m running a vista business operating system. 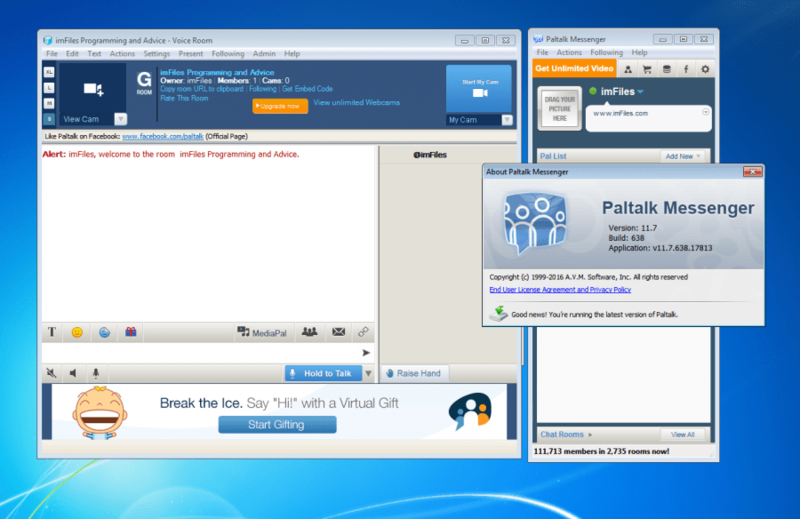 @Karim, Dont think you need NET.Framework for Paltalk but is always a good thing to Install. Especially for our Programs on imFIles..